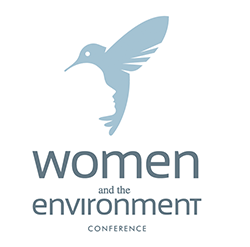 It was my great privilege to attend the first annual Women and the Environment Conference put on by the Social Justice Foundation formerly Miller-McCune Center for Research, Media and Public Policy. The event began the night before at the Granada Theatre where we all gathered to hear the wisdom of Naomi Klein. The Academy gave tickets to all their members who had the opportunity to join the others following the May meeting, it was the perfect experience for our members to have together. We were honored to be one of the sponsors. The World Business Academy supports a number of environmental and social justice programs in Santa Barbara and is always proud to play our role in making our community a better place. The following morning 180 women met at the Canary Hotel for an all day conference. The day began with a welcoming by Geane DeLima the CEO of the Social Justice Foundation and Sara Miller McCune the founder and Chair of Sage Publications. Following the opening remarks Roberta Cordero of the Chumash Tribes gave a blessing for the women and the day. Following the sacred moment we heard from powerful women as speakers, moderators and panelists. We heard about the State of the Nation for the Climate Movement, Environmental Justice, Sustainable Communities, Impact Business, Agriculture and Food, Conserving our oceans and coastline, Capital Fundraising, and Movement Building. Many of the women in Santa Barbara who are always giving of their time and energy were involved in this event. Laura Capps was the emcee for the day. Many of the moderators and panelists are well-known names in town such as Marianne Partridge the editor of the Independent, Maricela Morrales, executive director of CAUSE, Sigrid Wright, executive director of CEC and Holly Lohuis executive Cordinator, ocean futures, Cousteau foundation. Throughout the day we were all inspired by the amazing work being done so many women throughout the country. There was time to do networking, to talk and exchange ideas during the morning and afternoon breaks and the delicious luncheon on the rooftop over looking our beautiful city with the hills and ocean reminding us of the great gift we have by living in Santa Barbara and the true responsibility we have to ensure its environmental survival. The contents culminated with the presentation of seed capital awards to continue the development of three big ideas to advanced environmental and/or climate justice issues in the Tri-County area people spent the afternoon in groups pitching and listening to ideas of fellow attendees and selecting one that have the best opportunity of success. Each group submitted one idea and the entire conference took a real time. All of the ideas were categorized and stored at www.PSmag.com. This was a valuable and meaningful event both to attend and to sponsor, the day showed me that together we can change the future and its important that women are always given a seat at the table and the voice to change the conversation.